IDW #46: Sailbarge - Voting! Thread: IDW #46: Sailbarge - Voting! No voting for your own entries! Last edited by yoitisi; October 5th, 2007 at 07:24 PM. Just a few notes on this round. ScaryPotato: I know it isn't finished and all, but I think the main idea and shapes are there so I still included it in the poll. It's mainly some details to make it more interesting that's missing here. Edit: One more thing, IDW round 50 will be soon and I felt like doing something special with it maybe. My idea was to create an IDW avatar or something the like we could use as a banner, but any ideas are welcome. Please check out the discussion thread for any ideas. This was a tricky round, there were aspects from everyones' ships that I really liked a lot! In the end, I voted for D-Holme because I can imagine myself thumbing through a thick old reference book and getting caught up in the history of a big bad ship like that...on to the crits! mikedee - I really like the graphic style, but the design itself may be a little too open to interpretation. That being said, I can only dream of getting something like that done in the time it took you! D-Holme - Using your image as part of an archival type book is such a perfect concept for the style of your ship. The quality of parts of the ship and some sails is a little sketchy, but all in all I really love looking at this one. Legato - I like the sleek design, but wonder about it at the same time. it looks to me like there would be trouble on rough days having water wash up over the sides of the ship since they slope inwards. The design is almost like half-sub, half-ship I really do like seeing how you shade things, it's very precise and well done. One last thing I noticed looking at it is the sail looks slighty turned towards the viewer compared to the rest of the ship. RadioactivePJ - I like your design and take on the theme, but the balloons towards the back look a little out of place, especially with the pointy spars(thanks D-Holme for that!) sticking out of the main mast! The perspective seems a little out towards the front, could just be the curvature of the railing along the bow? Nice fantasy entry though! Yoitisi - Good to have you join us this round I really like the immensity of the ship and the dramatic angle you show it in. My only crit is that the shape of the hull doesn't seem to change; it's the same width from bow to stern. Maybe for something that I'm assuming sails in the sky, having a wide hull would be a hinderance though. It is nice to see some pen and ink art in here! 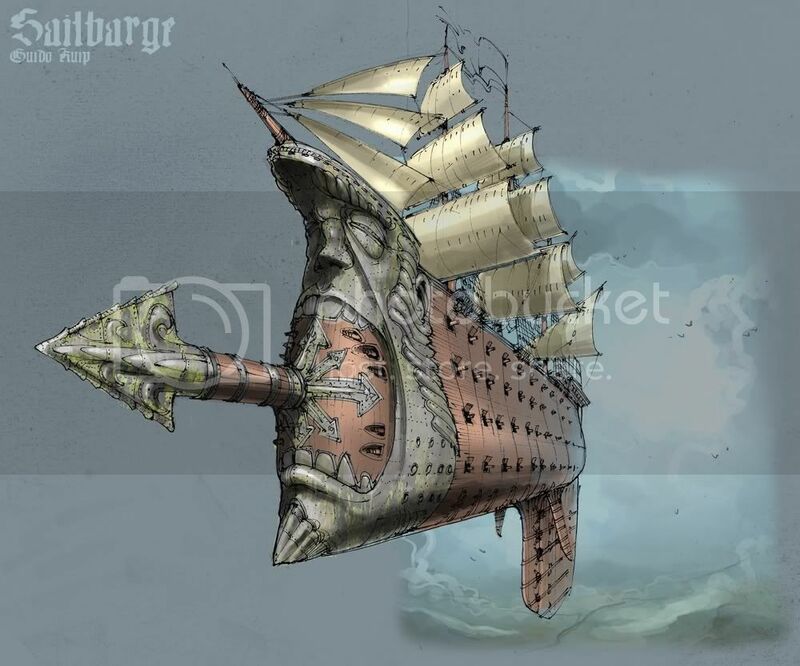 teyekanik - I like the fantasy concept of yours, but it looks like the ship has wings instead of actual sails...and photomanipulated ones at that! It is tricky getting a sense of scale on yours, the portholes on the ship seem about the same size as the rings holding the strapping around the balloon. Since you show such a bright day in your piece, maybe try showing some more reflections from the sky and clouds to tie everything together a little more. Many thanks to everyone for their great help this round. I was really struggling with my ship design, and all the advice really helped open my eyes to look at different ways of approching this week's theme! really looks like a 3d loose previs! but it seems really cramped on the page, and is hard to read from an industrial perspective... all in all though, what you did works, and i like the sale and support structure you have going on! to use a sail based on the shape of the leaf... so it kinda went from there! i really like the combination between a zerg overmind and a chinese junk i don't know if it was intentional, but the form is pretty hard to read. i still am not too sure which way is 'forward' and how big it is. ah the classic "flying boat without any means of flying" but i love what you did, basically turning it into a BFG with a bayonet! great job adding a personality with the face on the front, however i keep on looking at the arrow head and for some reason it keeps appearing as if its pointed away from me, but i'm not sure why :/ - as somebody said, i love the rendering, and i love your tight ink-looking lines! great job sliding into home plate at the last minute! love the figure of the central craft and the organic nature of everything going on. im not sure if the big upper left wing going out of focus like that helps much, if anything it brings into question the scale of the craft. but other than that i really have nothing to say other than it has my vote and great job! teyekanik: I like your delicate flying device. I wish you had pushed the rendering further. It lacks clarity. The insect wings are cool (even though they are simply stacked on photo elements - but I'd probably do the same thing in this case). D-Holme: Once again one of the prettiest pieces. You don't disappoint, as far as I can recall! Good job. I would have voted for you - but it's simply too straight forward a ship from a few hundred years ago. yoitisi: Therefore, you get my vote. 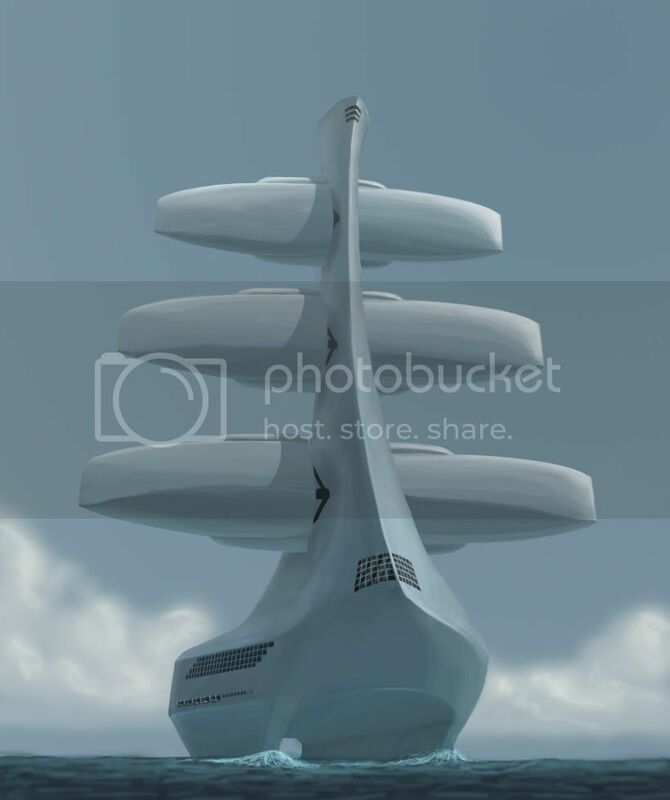 Very whack image, crazy flying vessel. Good job! Thanks for the helpful crits. I believe the 'balloons toward the back' that you are referring Scary Potato are my half assed attempt at a background balloon city, I have clearly failed in my attempt to convey the idea and brought dishonor upon my house, my guts will be lying on a bamboo mat by the time you read this. Since I shot my wad early and already told everyone what i think I'll get to the point, Mikedee, I voted for you, the illustration is sleek, confident, and totally outside the realm of what I expected to see. I thought all of the ideas were pretty neat, just participating in this kind of activity is exciting, educational and inspiring. ScaryPotato: You got my vote I couldn't decide who to vote for, but in the end I liked the potential of your design best. The rendering itself isn't finished, but all the main elements are there. Everyone else: thanks for the votes allready I'll put up some crits when I get around to it, probably tomorrow. ScaryPotato: Despite that you changed the perspective, I still think you could've chosen an even more dramatic angle. The left side of the boat (especially the windows) look a little off right now. Mikedee: Some people allready commented on it and I agree that the form isn't really clear. 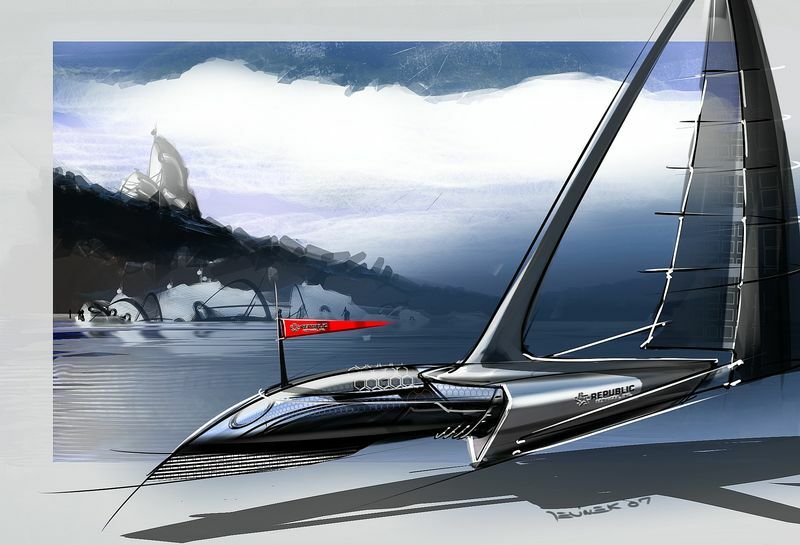 The atmosphere and idea that this sketch shows is cool, but it doesn't really show what it's all about except that it's a sailboat. Also, I'm not sure if I really like it that the sails are cropped out of the frame..
D-Holme: You do have sort of the same problem as Mikedee: in terms of style and atmosphere it fits with what you want to show us, but as for showing the actual design it doesn't really work. When taking a quick look it makes me think of a classic warship (which it is - sort of) but I miss the special part. This is probably also caused because I'm not such an expert on these ships like you are but the added stern and 'buildings' on the upper deck only show up after a second look. Legato: I think my initial comment in the posting thread still stands. By spreading the detail over both the front and the back you lose a focus point and you make the ship appear smaller than it actually is. Also, by using the darkest tones at the stern you create the same effect. Choosing a perspective like ScaryPotato would have emphasized the size better (and maybe even shown from the back instead of from the front to put the focus on the garden). That said, I like the idea of a 'green' ship. The garden in combination with the leafshaped sail works quite well together. RadioactivePJ: While I think you captured the form quite well, it all gets harder to read because of your use of colors and lighting. The first thing I noticed is that it all looks a little flat. This is mainly because you use the same tones in the fore- and background (the balloon city is rather dark, while with a little atmospheric perspective - things further off appear lighter- it wouldn't overwhelm the ship itself so much). The ship itself lacks a little contrast, which makes it fade a little into the background. I would expect some nice shiny highlights on it, together with some sharp and dark shadows. The clouds in the background are a bit too intense, which in turn makes them appear to be in the foreground. Myself: Yeah well, apart from some perspective issues like the battering ram up front being at an angle and the face being a bit lopsided, it's just all done a bit too quick I think. Also, designwise it isn't really thought out well enough to make it really stand out. I still like it, but it just isn't really a portfolio piece. Teyekanik: The first thing that jumped to my eye was the huge open space on the right half of your canvas. What function does it have? I think if you'd cropped the whole piece the design would've come out much stronger than it does now. Also, the actual size of your ship is hard to guess. I only just noticed the little windows on the sides, which made me think it was a lot bigger than I first thought. However, adding the dragonfly wings and the lack of other scale-showing details make it appear smaller. Last edited by yoitisi; October 10th, 2007 at 05:19 PM.